Dolls showcase Monster High characters' freaky flaws. 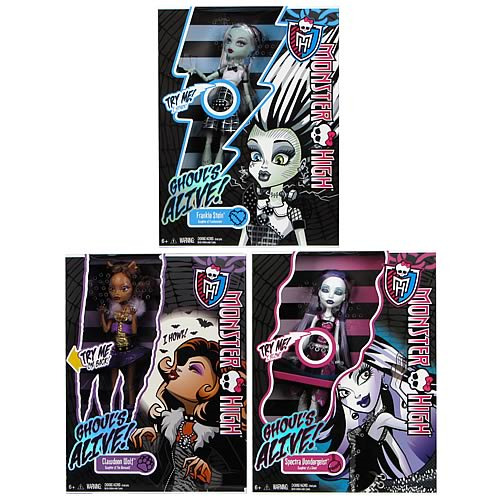 Set includes Frankie Stein, Clawdeen Wolf, and Spectra Vondergeist! Featuring lights and sounds, they include a doll stand. For the first time ever, the ghouls of Monster High are brought to life! Featuring lights and sounds, Monster High Ghouls Alive Dolls showcase the characters' signature freaky flaws. Each doll wears a modified, over-the-top version of her original outfit and comes with a doll stand. Ages 6 and up. Frankie Stein amps up the energy as her skull, rib cage, and bolts light up to electrifying sounds. Spectra Vondergeist glows blue and makes ghostly noises as she haunts the halls for gossip, and it must be a full moon since Clawdeen Wolf tilts her head back, closes her eyes, and howls at the sky with her arms in the air!